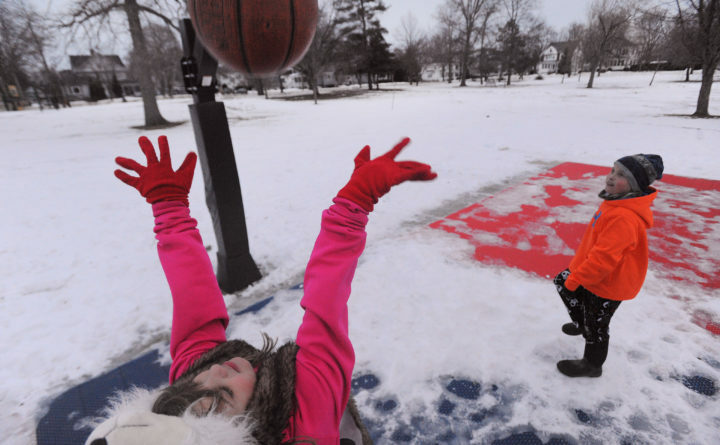 Lillian Young, 9, of Bangor (left) takes a shot at the basket while shooting hoops with her twin brother Gavin Young (right) and their father Rob Young (not pictured) at Fairmount Park, Jan. 21, 2013. A western Maine school district has decided to extend its school day by an hour to make up for snow days. The district, which includes Dixfield, Canton, Carthage and Peru, needs to make up for five snow days. With five extra hours added to the school week, the district could make that up within five weeks, Doyen said. RSU 56 canceled classes on Monday due to snow.